Bath, England has been near the top of my bucket list for most of my life. Over 25 years ago at summer camp, I met a young woman from Bath. She told me stories about a beautiful town in the southwest of England that had hot springs and looked like it was right out of a movie set. Nearly three decades later, we visited Bath to see for ourselves. It turns out she wasn’t lying. 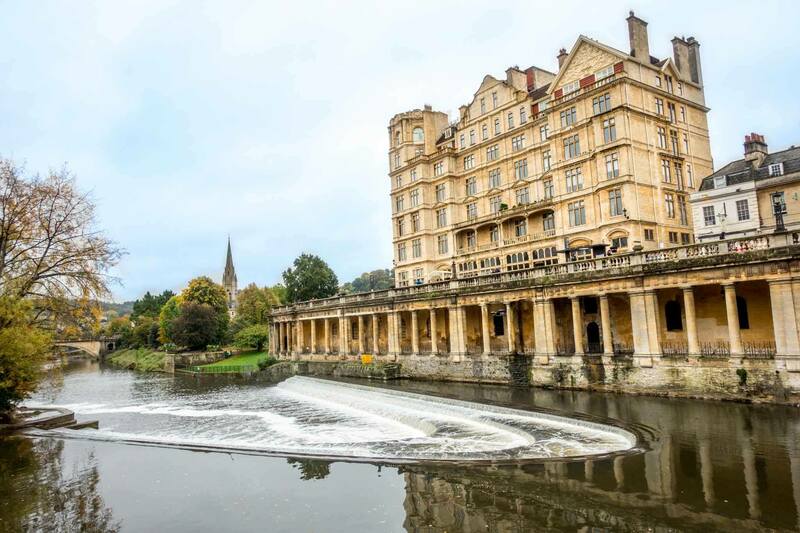 It’s a welcoming, charming city, and there are lots of fun things to do during a weekend in Bath. Bath’s small population of less than 90,000 welcomes more than 4 million visitors every year to this UNESCO World Heritage City. 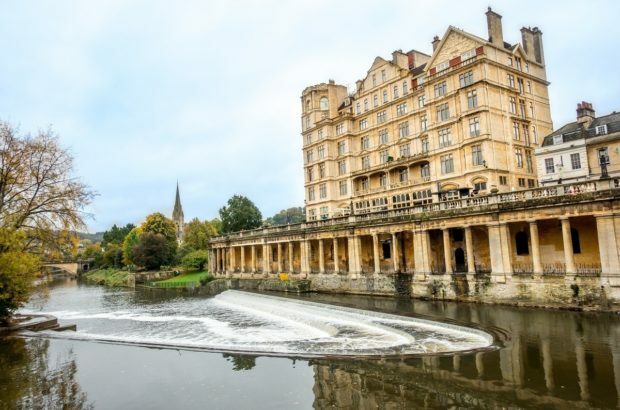 Being roughly 100 miles west of London, it’s possible to visit Bath as a day trip from the capital, but spending a night or a weekend in Bath is an even better choice to give yourself more time to explore. The town’s history goes back thousands of years – it was actually the Roman outpost of Aquae Sulis. Founded on the banks of the Avon River where hot springs bubble up to the surface, the springs gave birth to the town. Traders and religious pilgrims would bathe in the waters. These days, the pilgrims are the tourists and spa goers who seek out the healing waters. One of the major Bath tourist attractions, the Roman Baths date back as far as 60 AD when the original temple was constructed and the natural hot springs were channeled inside. There have been many phases of development and destruction over the centuries, providing lots for visitors to see today. 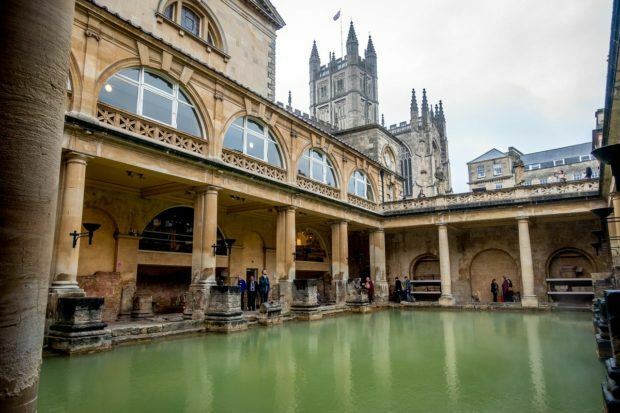 Among the fascinating sites at the Roman Baths is the Great Bath (the surrounding statues were added in Victorian times), the sacred spring, and the remains of the Temple to Sulis Minerva. The first-rate museum and entertaining audioguide explain the importance of the site and its preservation. Because seeing the site is one of the top things to do in Bath, it can get quite crowded, especially with tour and school groups. We recommend going early or late to avoid the lines, if you can, and leaving at least two hours for a proper visit. If you actually want to dip into the water, you need to head two blocks down the street from the Roman Baths to the Thermae Bath Spa. 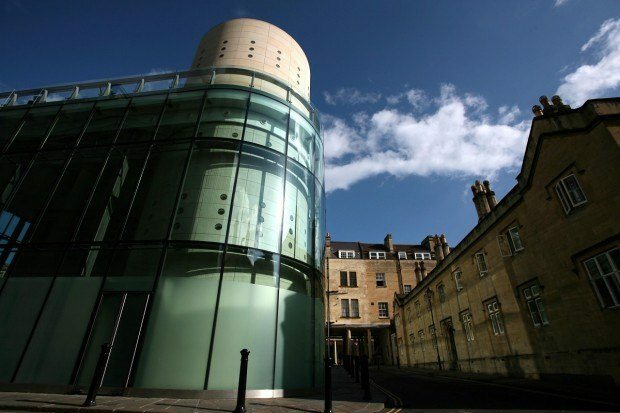 This amazing, modern spa complex quickly became one of our favorite places to visit in Bath. 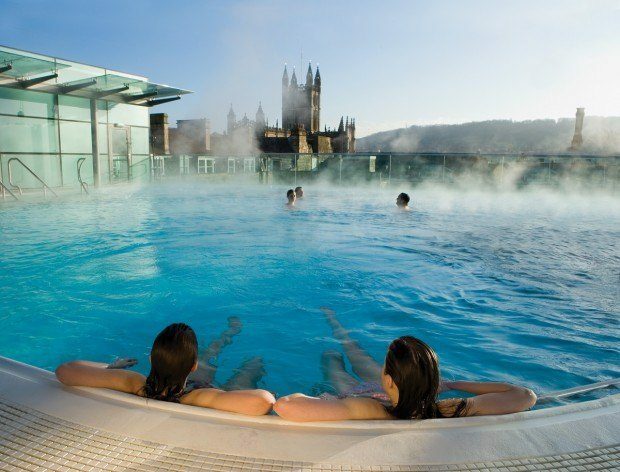 Thermae Bath Spa has a stunningly beautiful open-air rooftop pool to look out on the city and a giant relaxation pool. With the additional steam rooms, spa treatment rooms, and on-site restaurant, a visitor could spend hours pampering themselves in the waters. Take a little stroll along the River Avon to the Pulteney Bridge. This unique, 18th-century construction is one of the most photographed things to see in Bath. With classic Georgian elements like pilasters and pediments and tiny, leaded domes at both ends, the bridge was funded by landowner William Pulteney as part of an effort to create a “new town” including land across the river. The tiny stores that span both sides of the bridge include cute cafes, charming flower shops, and more. If you’re lucky, you can get a prime spot over the river while enjoying a cup of tea inside. If there’s a local distillery nearby, you can guarantee it will be on our list of places to visit, so stopping by the Canary Gin Bar was one of our mandatory Bath activities. If the detailed menu isn’t enough, the helpful bartenders will walk you through the different notes and flavors of any one of their 230 gins, and you can sample their small-batch Bath Gin Company gins, too. In the cellar below the bar, you can see the copper still and botanicals used for flavoring the Bath Gin. And, if the infused-spirit moves you, consider taking a gin-making class in the Distiller’s Bar, which you’ll leave with your own custom gin. If you’re spending more time in the area, don’t miss the Oxford Artisan Distillery in Oxford just an hour away. We didn’t quite get the idea of the bun…until we tried it. Situated in Bath’s oldest house is Sally Lunn’s Historic Eating House. They claim themselves to be “one of the world’s most famous eating houses.” That’s a lot of hype, but Sally Lunn’s actually delivers. The focus is the bun: a massive teacake. The warm buns are served as a half bun, with the tops served with sweet delights and the bottoms served with savory goodness. Whether you get a half or a whole, the buns were amazing! Our favorite was the cinnamon butter, which was like a giant cinnamon roll. They were so good that we brought some back to the US with us. Day or night, the skyline of Bath is dominated by the beautiful Bath Abbey. During the day, its 161-foot belltower is visible from all around the city, and the bells ring out. At night, the illuminated facade seems mystical, and the details of its Gothic exterior are somehow even more prominent. Tracing its roots back to the year 757, the current Bath Abbey was constructed in 1500. Inside, you’ll find richly colored stained glass, fan vaulting on the ceilings, and hundreds of wall memorials and floor stones. Visiting the Abbey is free, and behind-the-scenes tower tours are available for £8 every day except Sunday for those wanting a closer look, so it’s definitely worth at least a quick visit during your weekend in Bath. 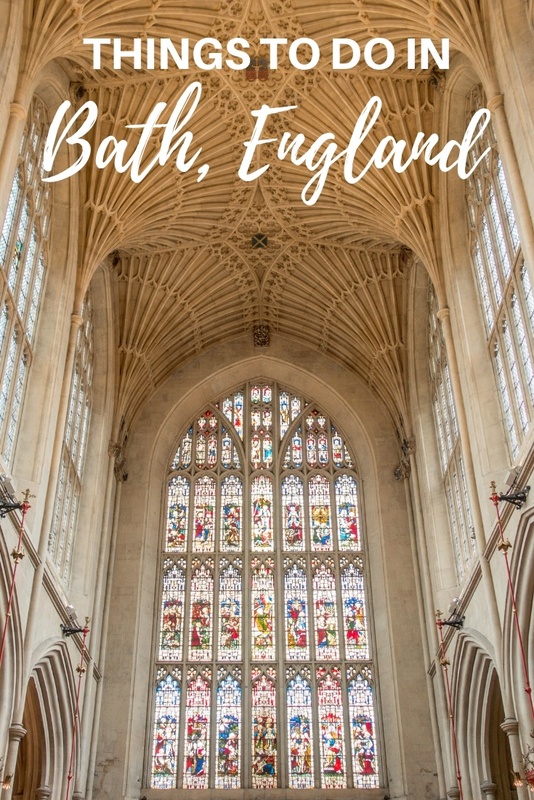 Note: Bath Abbey is undergoing a significant renovation project to restore the collapsing Abbey floor and make other improvements to the building, including using Bath’s original hot spring as a source of heating and modernizing certain facilities. The project is intended to last through at least 2021, but the Abbey remains open as normal. Bath’s most famous resident was the novelist Jane Austen. Austen was already an accomplished writer when her family moved to the city, however, Austen didn’t write much during her time here. Bath did provide deep inspiration for elements that would later be included in her two most famous works: Sense and Sensibility and Pride and Prejudice. At the Jane Austen Center, you can experience a bit of Austen’s life in Bath. The Royal Crescent is one of the most famous streets in England and one of Bath’s most famous landmarks. This curving row of 30 uniform Georgian townhouses, built in the 1770s, looks much like they did when they were constructed 250 years ago. Most of the townhouses in the Royal Crescent are private homes, but Number 1 Royal Crescent has been turned into a museum. Furnished with authentic decorations and period furniture, the museum shows how Bath’s most fashionable Georgians lived in the late 18th century. Just opposite the Pulteney Bridge, the Bath Guildhall Market is the oldest shopping venue in the city. A stop here satisfied our need for caffeine and our compulsion to always visit markets whenever we travel. With about 20 cute shops and cafes, the market is the perfect places for a little browsing and a little snacking when you visit Bath. For a small town, Bath has a robust culinary scene. There’s far more than Sally Lunn’s buns in Bath. Head to the tough-to-find Sub 13 lounge for amazing cocktails and first-rate mixology. If you like meat, the Cowshed serves world-class steaks with a beautiful view of the surrounding hillsides. For lighter fare (or a late-night dessert), head to Bill’s, which has a broad menu and a kitschy ambiance. While in Bath, we were the guests of the Thermae Bath Spa. All opinions of the beautiful, delicious and relaxing are our own. All photos are our own unless otherwise noted. Note: Some links may be affiliate links, which means Travel Addicts may earn a few pennies if you buy something at no additional cost to you.